It was after work on a Thursday night when Chauncey and I walked into the “Own Your Story” workshop held in a cute, modern, co working space here in San Francisco. Chauncey and I weren’t exactly sure what to expect but thought well we both own our stories on the daily so how hard could this be, right? I’m not going to say that the workshop was difficult but it definitely made you think and examine just how you own your individual story and how you can apply it to many different situations, i.e. business, project pitches, meeting new clients, trying to grab an investor, the list can go on and on. In listening to Olivia’s own story she gave as an example it began to resemble the makings of an elevator pitch, a popular 90 second pitch about a particular topic that could be done in the time it takes you to ride on an elevator. Except this time we were given a three minute time frame and encouraged to find pieces of our story that could be relatable, informational, and captivating to an audience. This was a tall order considering both Chauncey and I along with the other women that made up the workshop could start our own interesting stories from any number of defining points in our life. Thankfully Olivia gave prompts to try and help this room full of women iron out the makings of their own stories. After sometime working through and coming up with what I’m sure a lot of us would call the “first draft” of our story we then split into groups and took turns sharing. I think this part was probably my favorite because it allowed each of us to open up, hear about what we all do, and what each of us are looking for. It also allowed for some amazing feedback and encouragement to go after what we as individuals were seeking along with pointing out helpful hints as to where we should elaborate and give more information to minimize confusion and questions. Experiencing nothing quite like this workshop before it only made me want to sit down with Olivia, the mastermind and woman behind all of this, to get some insight about how “Own Your Story” came to be. OKAY SO HOW DID “OWN YOUR STORY” GET IT’S START? THERE WERE A LOT OF DIFFERENT WOMEN AT THE WORKSHOP I WENT TO, DO YOU HAVE RECOMMENDATIONS ON WHO SHOULD ATTEND? Own Your Story really is for everyone, even self-identifying men! As humans, we connect and are motivated to act when something or someone makes us feel a certain kind of way so being able to concisely convey who you are, what you do and why is so important. So, if for example, you're job hunting, looking for a co-founder, pitching investors, or hoping to be mentored or become a mentor, this workshop will help you create a compelling and authentic personal brand story that will galvanize your target audience into action. WHAT’S THE MOST REWARDING THING ABOUT DOING THESE WORKSHOPS? While in the workshop I love seeing people support and encourage each other. When we move into small groups everyone is given the undivided attention of complete strangers. And that opportunity to be heard does something for them and in them. Seeing people lean in to hear each other, cry, clap and be wowed by each other's stories is so rewarding for me. Post workshop, I love being tagged in photos of people that were in a small group together hanging out, getting coffee or meeting for lunch. Knowing that the bond they felt that during the workshop continues beyond the hour or hour and half that I had with them makes me proud beyond words. And grateful for the gift that is this workshop! Olivia has shared her "Own Your Story” workshops with clients she worked with directly for five years and just this past year shared it 24 times in eight different cities across the country! With hopes to double that amount in 2019 you can find a complete list of her next workshop locations and speaking engagements on her website and by following her on Instagram and LinkedIn. 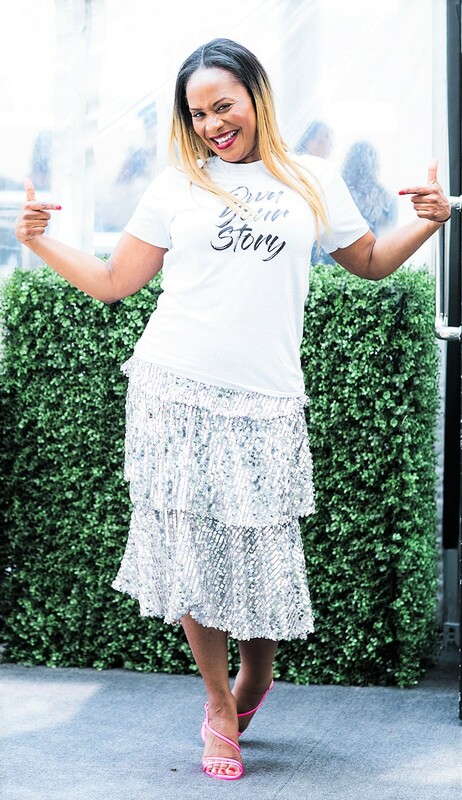 So She Slay readers will also be granted 25% off of Olivia’s next Own Your Story workshop happening February 12th at The Wing in New York with the promo code: SoSheSlays. Get your tickets!